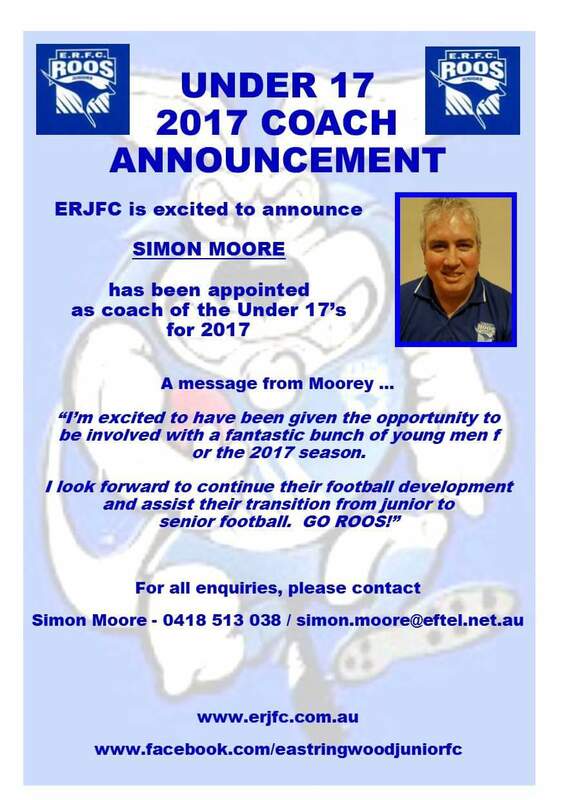 The U17 Academy Program is an East Ringwood Junior Football Club initiative that was formulated back in 2012 by members of the football committee. Unfortunately it was the loss of an East Ringwood player and valued teammate that was the kick off point, and where the committee decided, that it was time we engaged in assisting this important age group of young men, how to deal with the social issues that present themselves, as they move into the adult world. Yes our education system provides these activities and helps teach discipline and respect , but as a football club in the community we also have some responsibility for the development of these players. They are the role models for the younger age groups behind them. The Academy Program is designed to provide a framework of information seminars (There are 3 seminar nights during the season) and community based activities, to complement the player’s on field exploits and reinforce their daily endeavours. It is a club sanctioned program that has the support of the coaching staff and hence all players are expected to attend the seminars and participate in the community based activities. Last season we had much interest from the league and other clubs about what we were doing, and the club received positive praise from the community-based groups at which the boys participated. As a part of the program we are pleased to have Marg Kittelty the Club Chaplain involved, who has a wealth of knowledge to offer and who is very keen to engage with the boys where necessary. She is very approachable and there to assist with any issue or to just have a chat. In previous years our community activity was assisting at Liz’s Kitchen at The Bayswater Church of Christ, serving meals to those in need. This activity is up and running again and we have had 2 player volunteers for each Wednesday night that has been made available for us to assist. The players attend between 5.30pm – 7.45pm. Another of our volunteer activities has been assisting at Friday night Auskick. A rostered group of players has been attending these sessions. At the end of all this there is a reward, the Jake Munro Memorial Shield, this will be awarded to the player who shows true spirit, respect and responsibility both on and off the field.